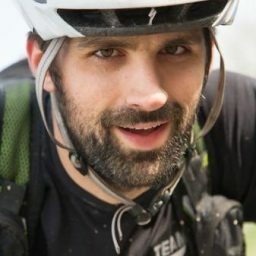 You might think that creating an article for goEast is as simple as sitting in front of a computer and writing about your favorite trip, piece of gear, or outdoor activity. However, the reality is, for most articles, you spend just as much time outside taking photos, recording GPS tracks, and refreshing your memory of a trail’s nuances. 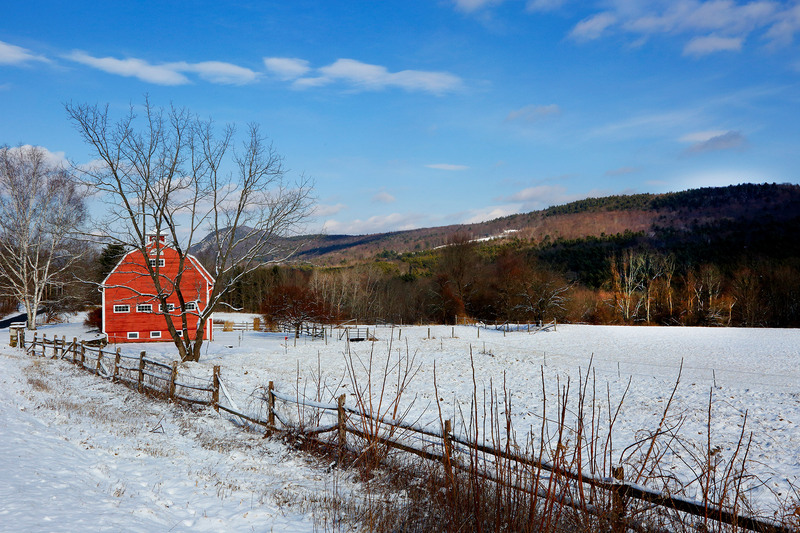 With deadlines looming this winter, we’ve often had to take trips in typical Northeast winter conditions—think cold temperatures, high winds, and snowy weather. It’s here that we’ve come to appreciate the EMS Alpine Ascender Stretch. The Ascender’s versatility managed to give us a good time up and down this ultra-classic route. 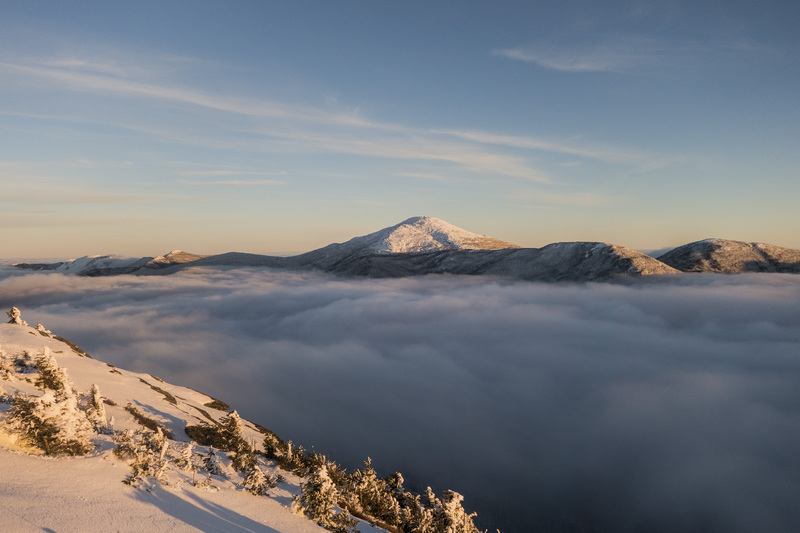 On a recent reconnaissance trip up Mount Washington via the Winter Lion Head Trail, the Ascender proved its merits. There, we made frequent stops—in spite of the winds gusting up to 100 mph—to gather waypoints and shoot photos for an upcoming article. Layered under our hard shells while we were above treeline, the Ascender performed equally well when we dashed across the Alpine Garden as it did while we stopped for photos. Throughout, it breathed on the move and insulated when we stopped, thanks to its Polartec Alpha insulation. 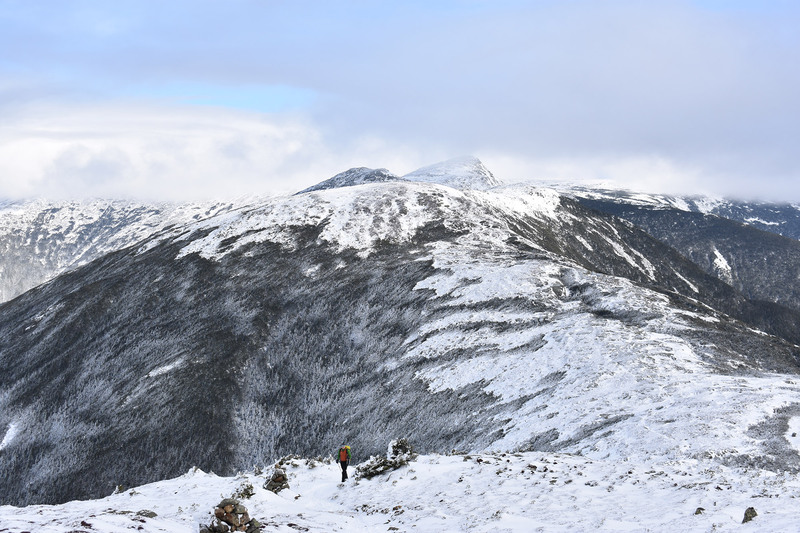 Overall, the Ascender’s versatility managed to give us a good time up and down this ultra-classic route—always a concern during the short days of winter. In part, this was due to not having to dig around our packs for a puffy every time we stopped. 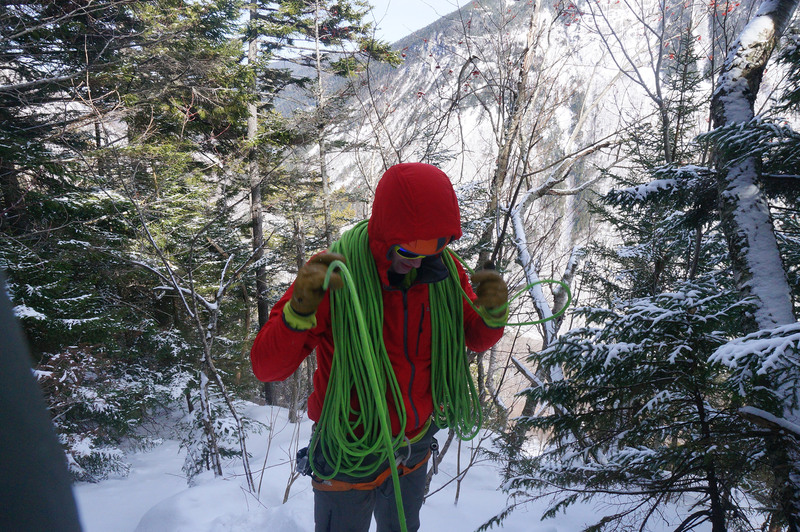 A recent ice climbing trip in Crawford Notch further highlighted this go-to layer’s value. 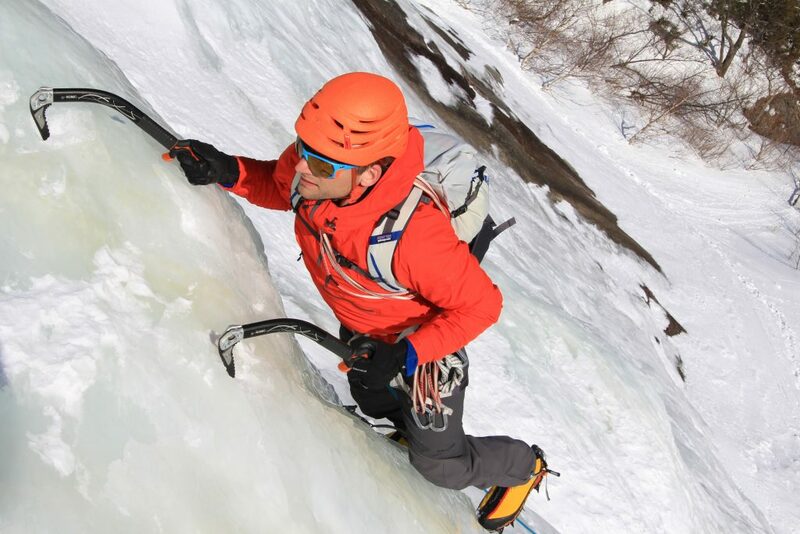 Ice climbing’s mechanics involve working hard and getting warm while climbing, only to stop and freeze at the belay. The misery builds up if you’re pausing here to take notes or photos for an upcoming article, like we were. The Ascender proved its versatility once again, however. That day, we wore it as our outer layer and found that it breathed while on the go and still kept us warm when we stopped. As well, the insulated hood fits well over a climbing helmet. We also appreciated the large internal pockets for stashing a notebook, camera, snack, and gloves. These days, it seems every innovation gets labeled “game-changing.” But, the EMS Alpine Ascender truly is the next step forward. The Ascender looks and functions like a traditional puffy coat, making it easy to pigeonhole. But, we’ve discovered that it’s so much more. In fact, this winter, we’ve used the Ascender just as much as a traditional midlayer as we have as a lightweight belay jacket. 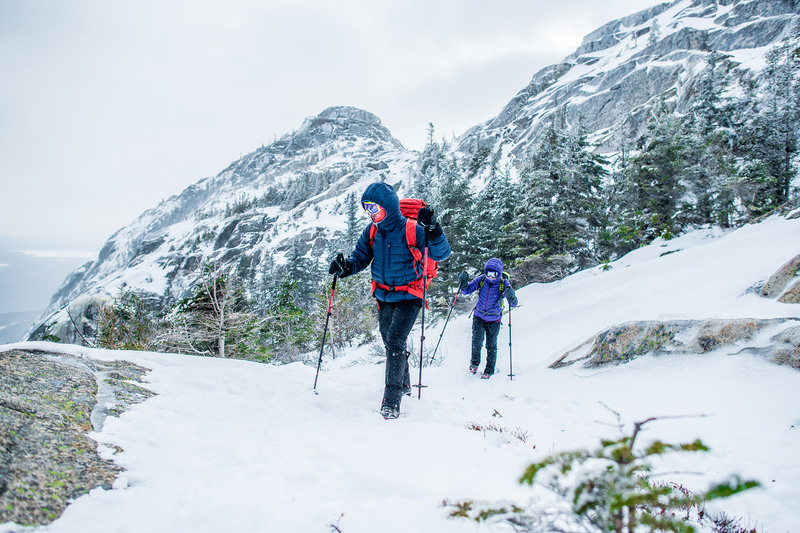 Accentuating that, the Ascender is much warmer and more packable than a traditional fleece midlayer, and you can still wear it like a standard soft shell. These days, it seems every innovation gets labeled “game-changing.” But, the EMS Alpine Ascender truly is the next step forward. Particularly, its overall construction increases the functionality of an essential layering piece. Over the past year, we’ve tinkered a lot with active insulation. With the Ascender, we’ve been trying to find the perfect application for it within our layering strategies. At the end of it all, we’ve concluded that it will be either on our bodies or in our packs on most trips. 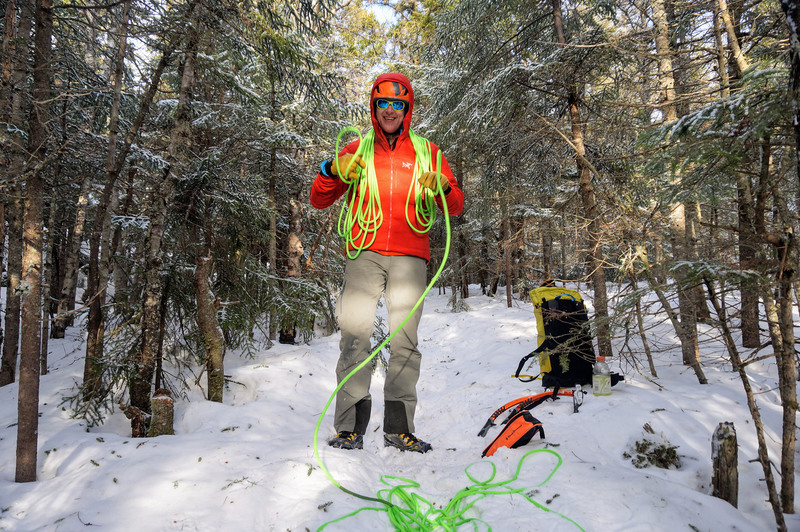 Whether you’re freezing on the ski lift and then shredding downhill, working hard while ice climbing and cooling off while belaying, or doing any other activity that involves varying exertion levels in cold environments, the Ascender should be a key part of your layering system. Anybody who’s slipped on black ice knows that it can form in the most unexpected places. 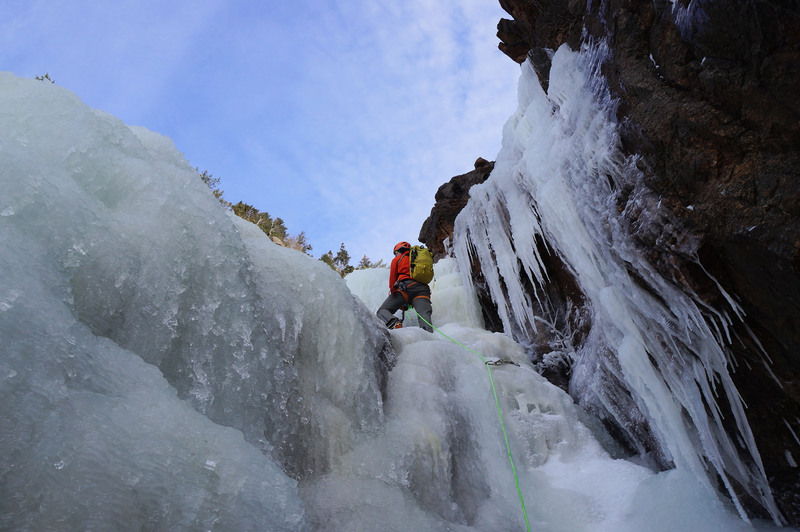 When that ice starts to freeze vertically, we, as ice climbers, typically want to climb it. How that desire manifests is sometimes quite ironic, however. In the Northeast, you’re equally likely to find climbers swinging their way up a roadside culvert, an abandoned quarry, or the walls of an old railroad cut as you are an alpine classic, like Shoestring Gully. 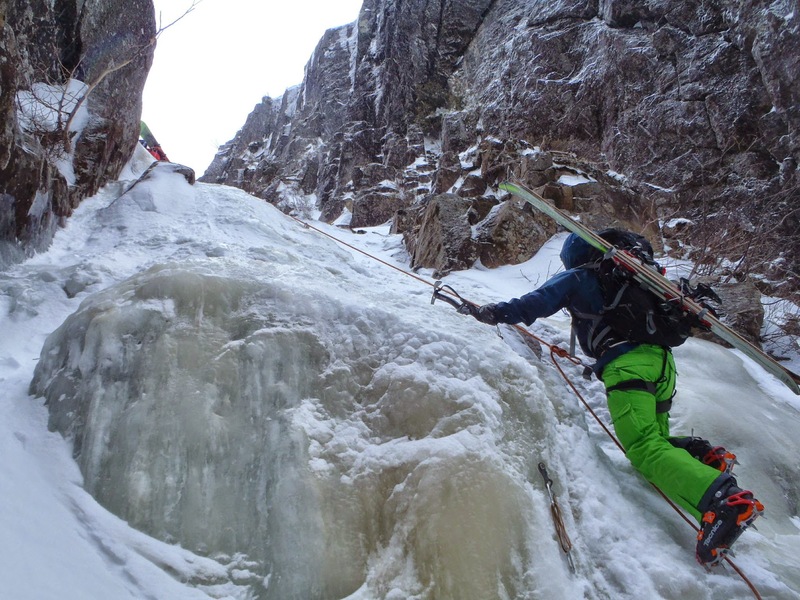 When most people think of ice climbing, their minds turn to frozen waterfalls, alpine cliffs, and remote gullies. What they don’t think of is shopping plazas, busy roads, and concrete, much less Worcester, Massachusetts. 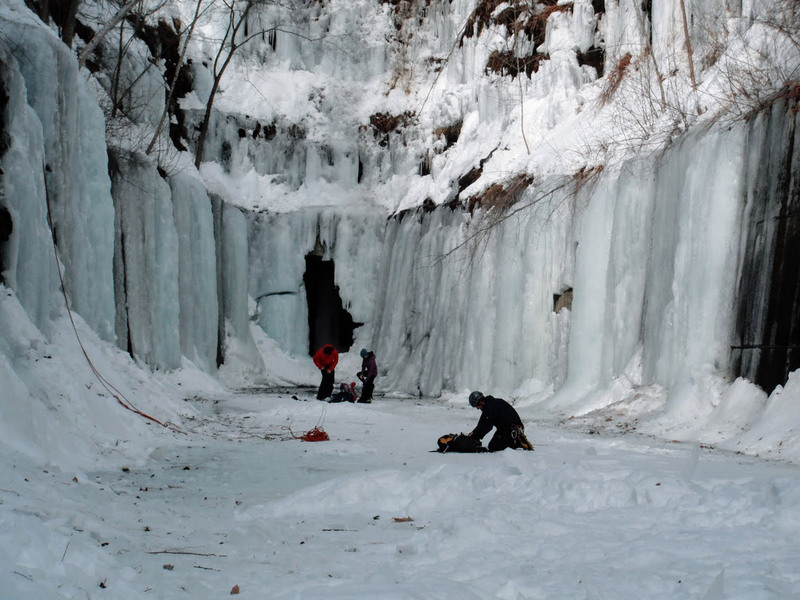 However, that’s where they’ll discover one of Massachusetts’ most popular ice climbing destinations: Auburn Ice Canyon. Located at the corner of Worcester, Millbury, and Auburn—just minutes from the Mass Pike and Route 290—Auburn Ice Canyon started as a flood diversion channel for the greater Worcester area. Later, some discovered that the channel’s steep walls and melting snow above consistently icing over created steep ice climbs. 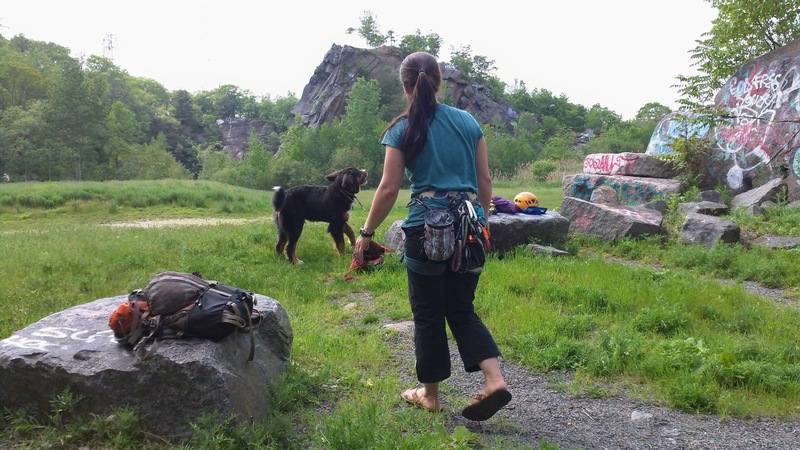 Although the entrance can be seen from the busy local road, Route 20, you’ll find the best climbing and longest routes by following the culvert to its end. Here, the rock walls turn to concrete and the channel into a tunnel. Because Auburn Ice Canyon is a drainage, its floor may consist of varying levels of water. 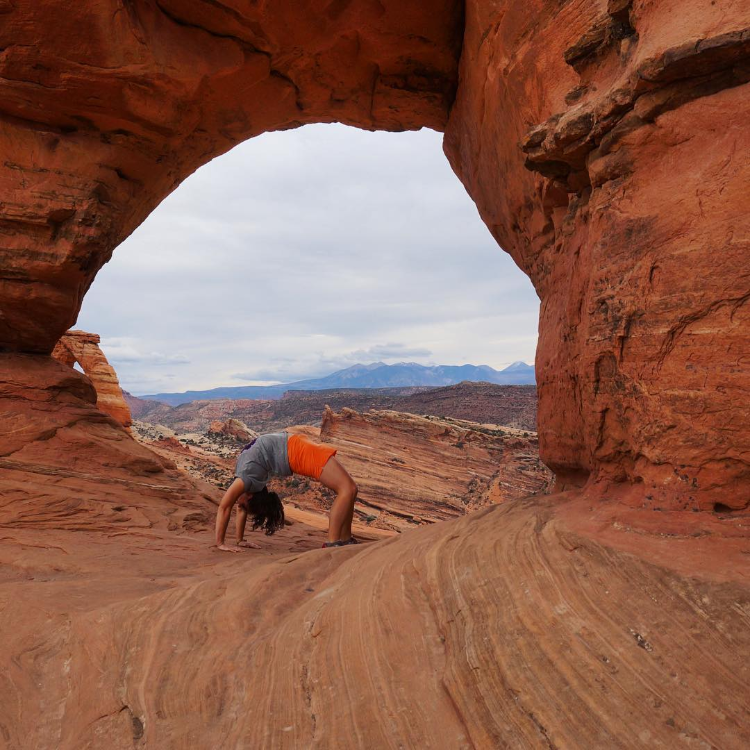 Thus, the best time to visit is after a long-enough cold stretch, which then freezes the canyon’s floor. 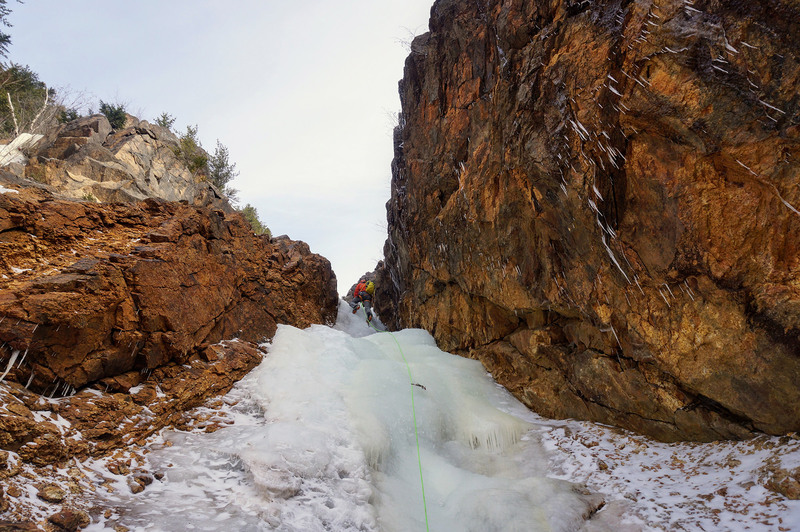 Popular with beginners and experts alike, Auburn Ice Canyon delivers routes steep enough for strong climbers to get a workout, and top-rope friendly attitude that newbies will appreciate. Leaders, beware: Suspect rock and interesting top-outs may make straightforward-looking climbs spicier than anticipated. 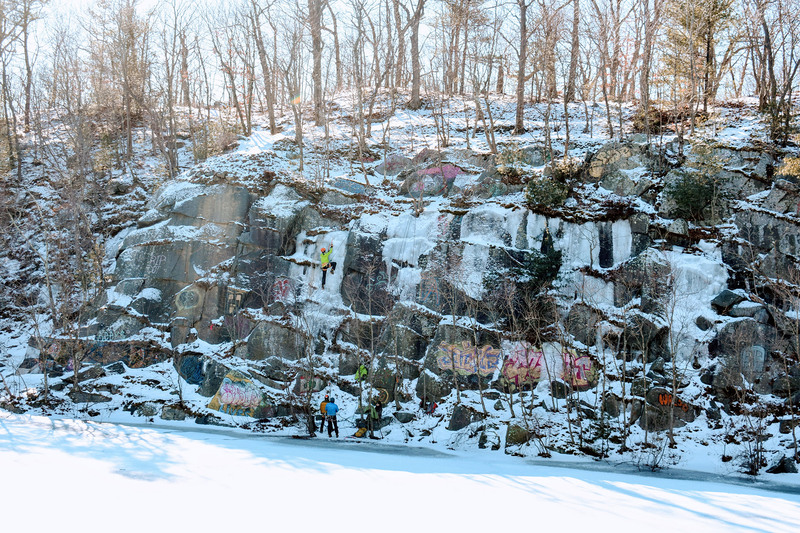 Although most people associate Quincy Quarries with rock climbing and graffiti, you’ll also find solid ice climbing at this close-to-Boston locale. Operating as a quarry from 1825 to 1963, Quincy Quarry earned the nickname “The Birthplace of the Granite Industry,” as places and businesses across the nation used its stone. More prominently, the Bunker Hill Monument features it to some degree. For the best ice climbing at QQ, start with “A Wall,” the first wall on the left after you make the five-minute approach from the parking lot. Depending on conditions, QQ has as many as five distinct ice flows, each providing 35-foot vertical climbs with multiple variations. The climbing itself is Scottish-like, mixing sometimes quite-thin ice with rock moves and turf sticks. This is especially true at the starts of the routes, with the best ice usually found higher up. 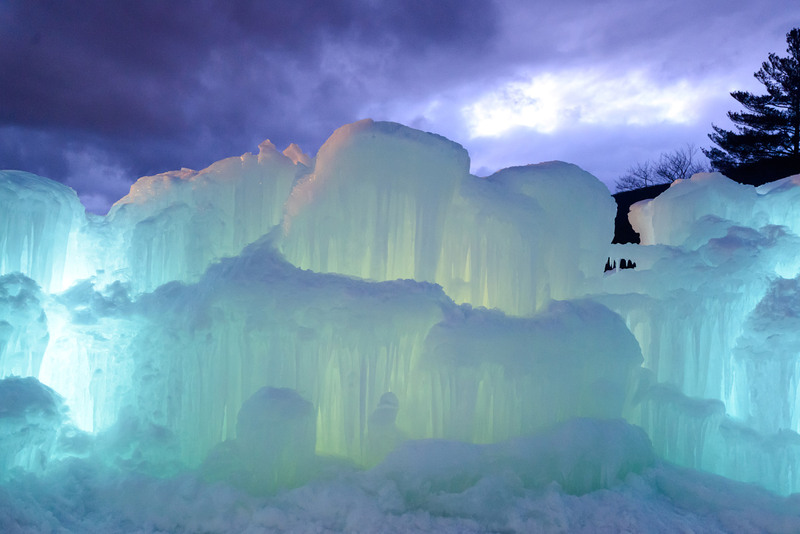 Of course, the ice here can be ephemeral. As a good rule of thumb, hold off on visiting until after a heavy rain or snow followed by two to three nights of colder temperatures. Although the ice usually hangs around once it comes in, it doesn’t survive every thaw. So, before you set up your top-rope, it’s a good idea to scope out A Wall from across the “Cove.” And, if the ice has unexpectedly come down, you’ll find fantastic dry tooling on Layback Corner and M Crack on M Wall (both 5.8) and on Finger Flux (5.11) in the nearby Swingle’s Quarry. As you work your way around QQ, you’ll easily notice remnants of the historic operation. Climbers regularly use the old “staples” for anchors, and even some “feathers”—shims used to help split the granite—are still in the rock. Particularly, you’ll see one at the base of a route on A Wall. And, if history is your thing, make sure to check out the Granite Railway on the Quarry’s backside. Established in 1826, it was the country’s first railroad and is now a National Historic Civil Engineering Landmark. Find it by walking down the path between J and K walls. 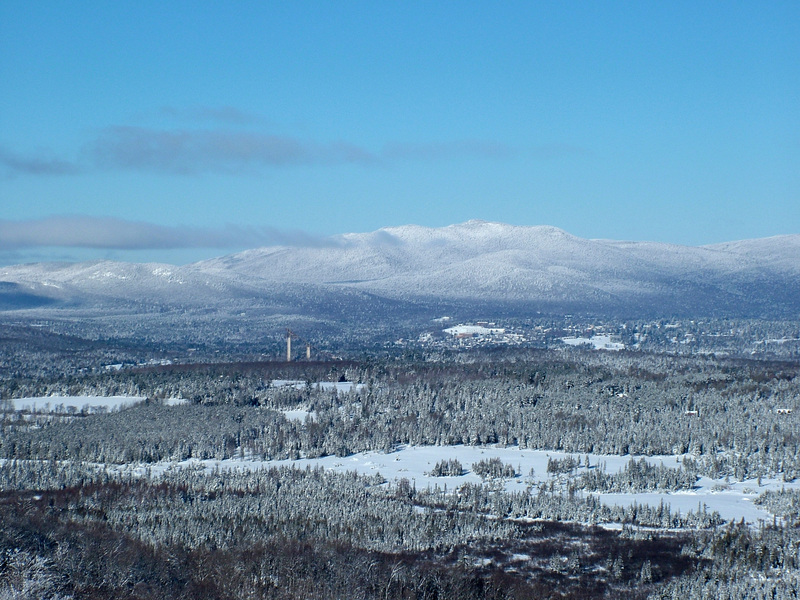 Keene is known as a quiet college town located on the New Hampshire-Vermont border. However, long before Keene State was founded, the city, like many in New Hampshire, was based around manufacturing. In part, the Cheshire Railroad spurred this development, carrying goods to market and outdoor enthusiasts (including Henry David Thoreau) to Mount Monadnock and the surrounding region. 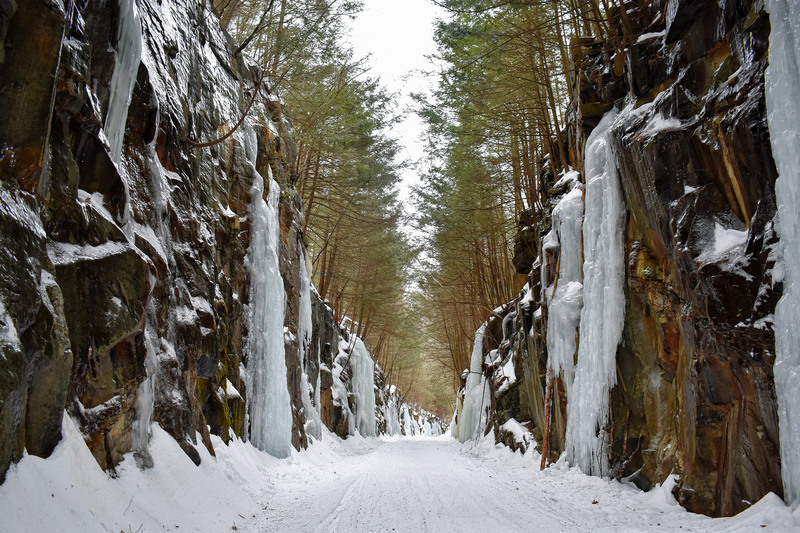 Although the railroad hasn’t run since the 1960s, the send train runs all winter on the Keene Railroad Cut’s walls, provided it’s cold enough. Approaching the climbing is easy, as it’s a short walk from an obvious pullout on Route 12 near the city limits. Even better, the approach is almost always packed down, thanks to the snowmobiles that frequent the Cheshire Rail Trail. This 42-mile long trail begins near the the Massachusetts border in Fitzwilliam, New Hampshire and ends in North Walpole, New Hampshire. You’ll know you’ve made it to the Keene Railroad Cut, or simply the Railroad Cut, when you get there. Here, the walls sharply rise above the old railroad bed, and numerous ice flows line its sides. Most routes stand between 20 and 30 feet tall, and while short in stature, they deliver steep climbing. And, convenience isn’t only found in the location and approach here. As well, sturdy trees, fixed anchors, and straightforward walk-arounds make top-roping a simple affair. Thus, it’s a popular destination for newer climbers and locals looking for a workout. 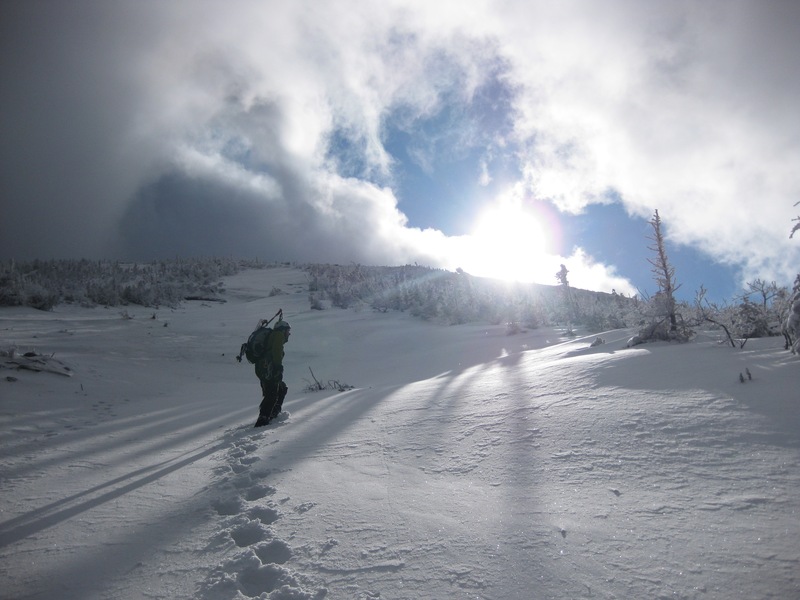 Pro Tip: Play nice with the snowmobilers, and keep your kit out of the middle of the trail. Their cooperation is key for access. 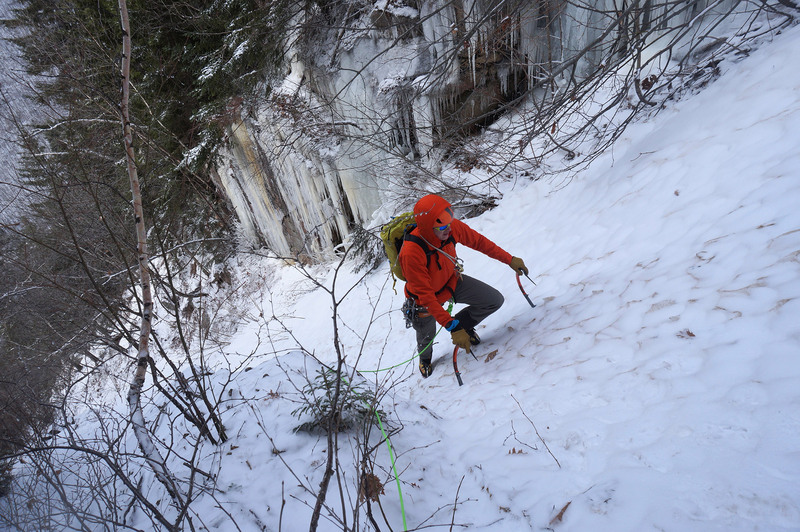 Although these three spots are not natural treasures, their local outdoor communities appreciate them for their easily accessible, close-to-home ice climbing. Have a manmade spot you’d like to share? Leave it in the comments, so we can check it out! 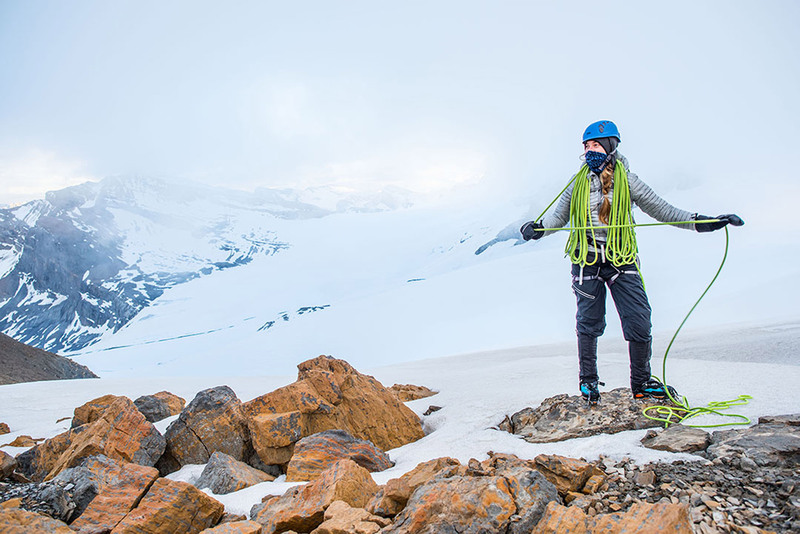 Easily accessible alpine-style climbing at a modest grade and in an amazing setting make Shoestring Gully a must-do climb for ice climbers of all levels. 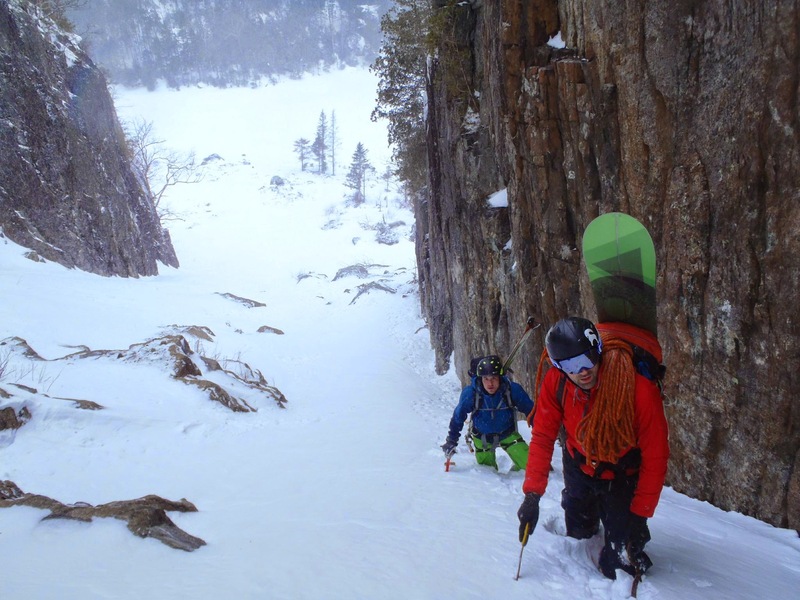 An ascent of Shoestring Gully in New Hampshire’s Crawford Notch is a rite of passage for aspiring ice climbers in the Northeast. 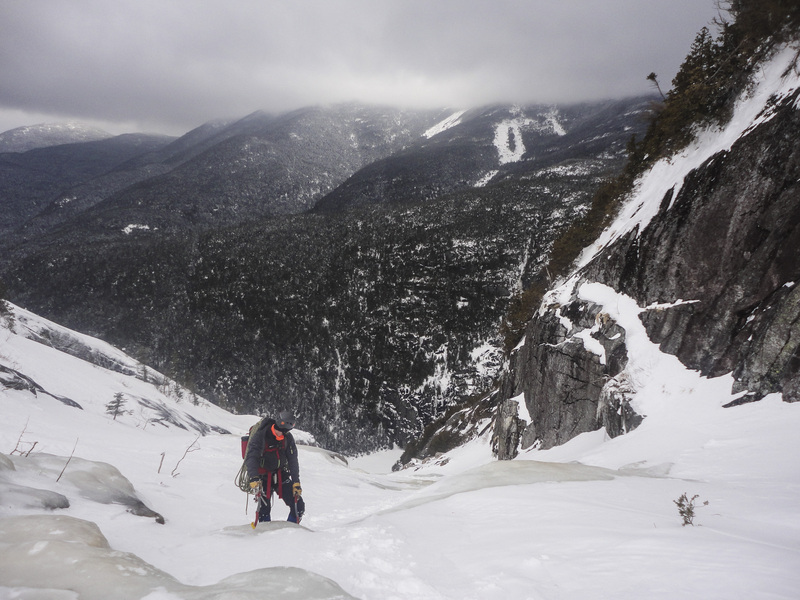 Offering 2,500 feet of varied climbing, an incredible view of Crawford Notch, and an alpine feel without the above-treeline weather and exposure, Shoestring Gully is perhaps the best moderate ice climb in New Hampshire. 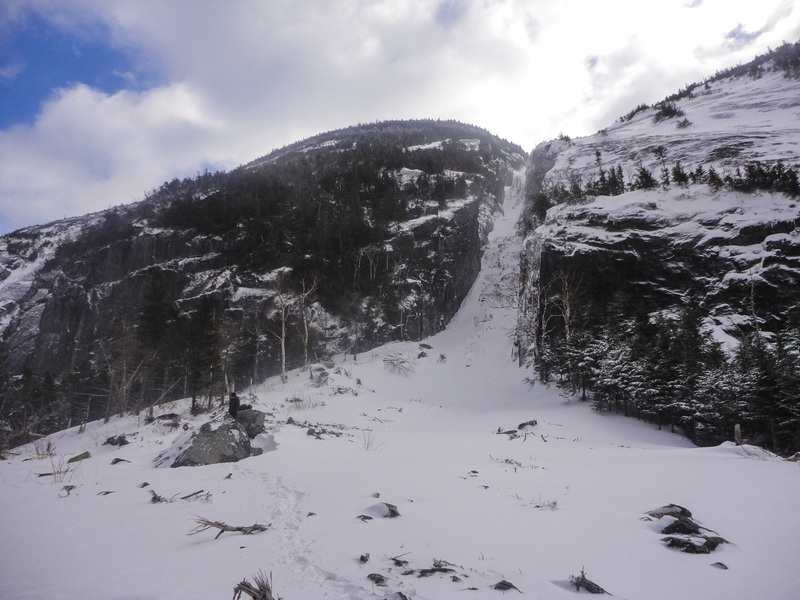 Shoestring Gully is located off Route 302 a few miles south of Crawford Notch and the AMC Highland Center, with the best parking at the Webster Cliff Trailhead (44.170673, -71.388153). The parking area accommodates anywhere from five to 10 cars, but space fluctuates depending on snowfall. This is a popular climb, so parking spots fill up quickly. There is additional parking available along 302 in both directions, but will add roughly an extra half-mile of hiking in each direction to your outing. From the Webster Cliff Trailhead, the most straightforward approach to the gully is crossing Route 302 and hiking up the Webster Cliff Trail. 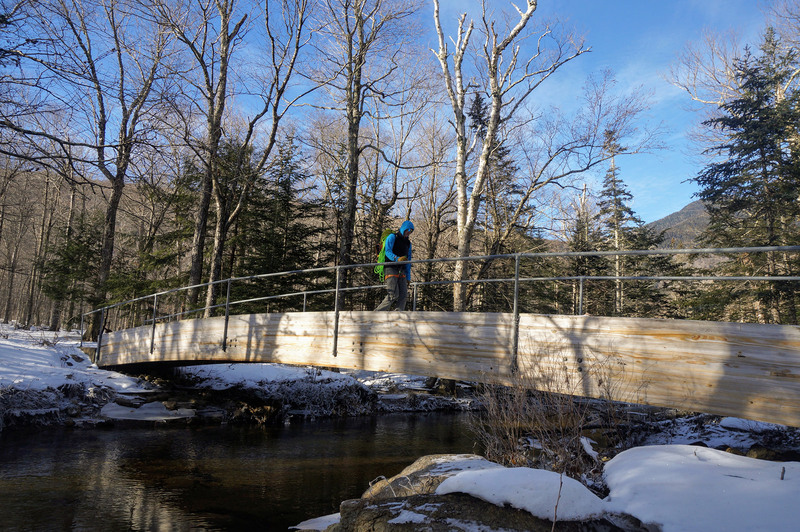 The trail is flat and, after you walk for a few minutes, comes to a bridge that crosses the Saco River. Take the bridge across, and at the trail junction slightly uphill from the river (44.171936, -71.385475), turn left (upstream) onto the Saco River Trail. The trail is often icy, however; if you find that’s the case, this is a good spot to put on either MICROspikes or crampons. Follow the Saco River Trail for approximately 0.5 miles, until you see the climber’s path leading uphill on the right (44.175751, -71.391571). Looking for a clue that this is the right gully? As a great landmark for heading uphill, a large boulder displays large painted trail markers for the Saco River Trail. Also, thanks to the popularity of this climb, the approach heading uphill is usually pretty broken in. 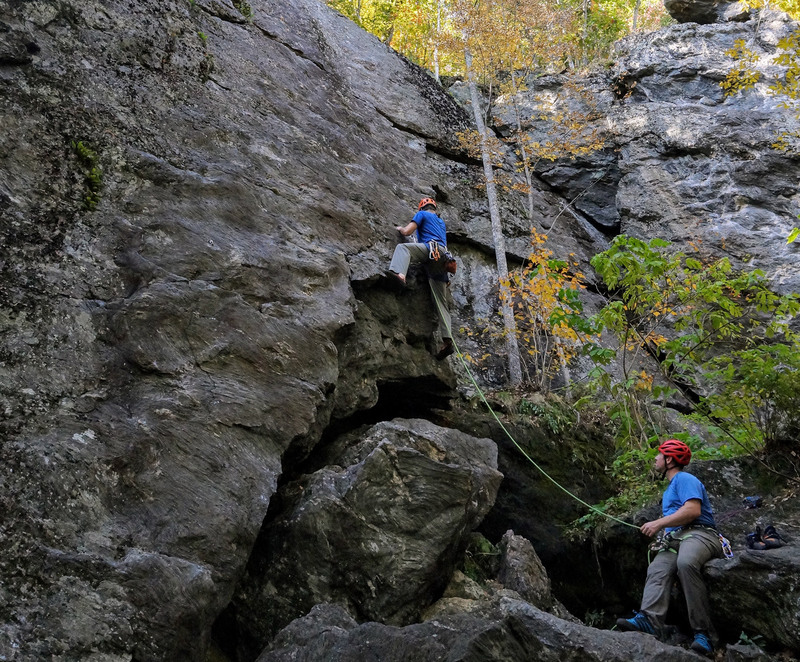 Historically, climbers have approached by parking roughly a half-mile further north on Route 302 and crossing the Saco at an old dam. Over the years, however, the crossing has gotten a bit spicy. Although this approach puts you directly below the gully and is shorter overall, it also means a road march back to the car on the descent. The climber’s path slowly gains altitude as it steadily moves into Shoestring Gully. 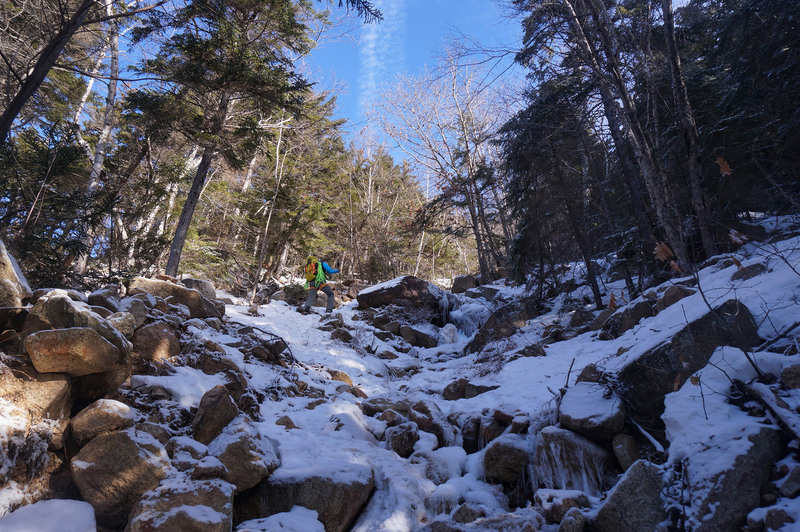 Once in the gully, the trail steepens as you ascend a bouldery stream bed that gradually opens up near the first ice flow. If you haven’t yet put on your crampons, this is the place to do so, as this section is often slippery, and the “real” climbing is fast approaching. 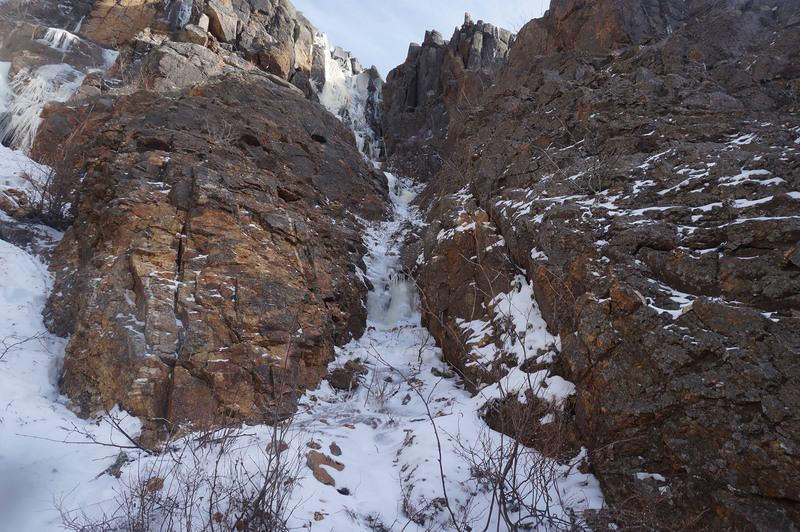 After roughly 1,000 feet of elevation gain, climbers will encounter the day’s first ice flow (44.178432, -71.386986) at the top of the stream bed. Just below this bulge, a well-worn flat spot is perfect for getting kitted—harness, helmet, crampons, ice tools, rope, and protection—for the climbing above. It’s also a convenient place to have a drink and a quick bite to eat before the rhythm and mechanics of climbing are involved. From the trailhead, it’s roughly 45 to 60 minutes to get here. 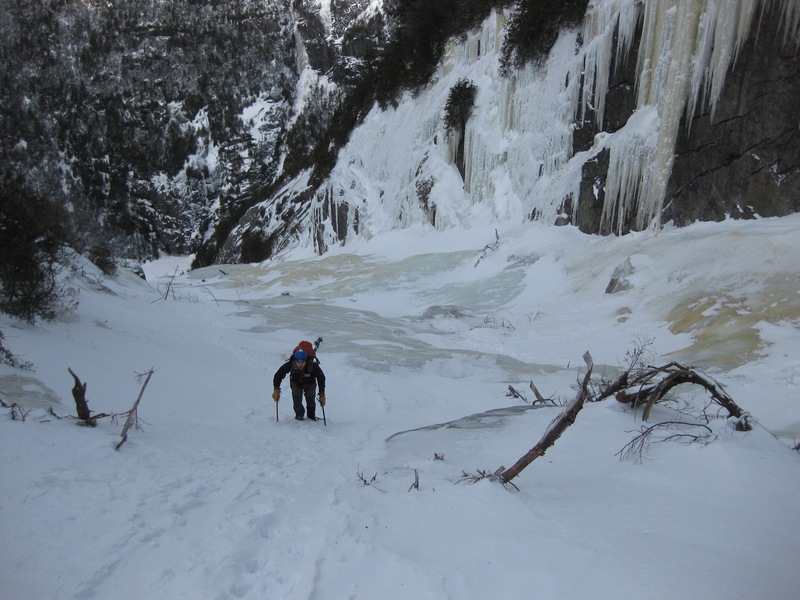 Most years, Shoestring Gully has a short (20- to 30-foot), moderate ice bulge at the base of the climb. 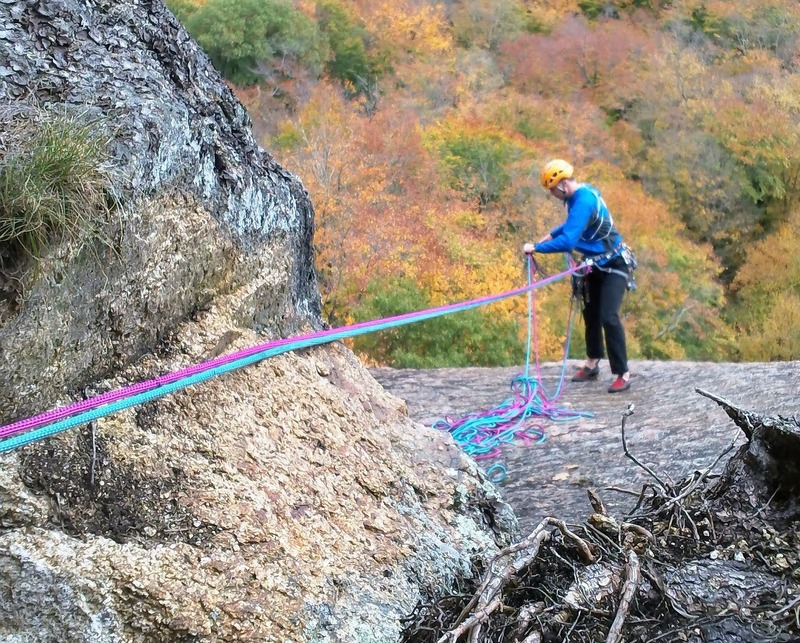 The bulge’s right side is typically less challenging, but one of the joys of Shoestring Gully is the opportunity to increase or decrease the climb’s difficulty to meet your skill level. On top of the bulge, climbers will find trees on both the gully’s left and right sides to use as anchors. As a tip, building an anchor on the left side offers a better view of followers, while building it a little higher on the right provides an easier transition to the snow pitches that follow. After the first ice bulge, the next few rope lengths of the gully typically consist of moderate snow with a few interspersed ice patches. 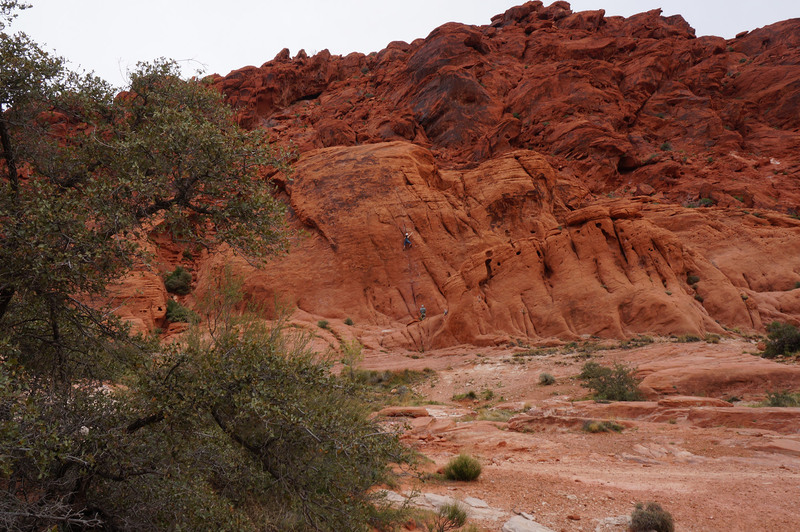 Climbers use a variety of techniques to move through this terrain, depending on experience, comfort, and conditions. 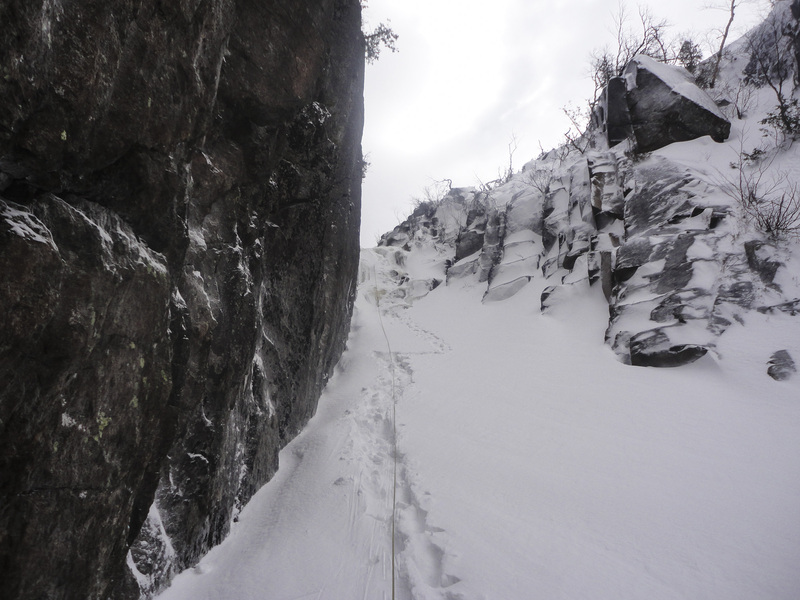 Some parties will simply pitch out the snow, as they would on any other type of multi-pitch climb. Others will shorten the rope and simul-climb—that is, climb together with running protection between them. No matter how you choose to approach this terrain, however, the ice patches and occasional trees on the gully’s sides provide protection and anchor opportunities. This section is also a great place to give your calves a break and show off your French technique (or practice it), thanks to the angle and nature of the snow. When the snow starts to transition to ice, the pitch begins to steepen, and the gully’s walls grow in prominence, build an anchor, and get ready for the day’s most technical climbing (44.17893, -71.385422). 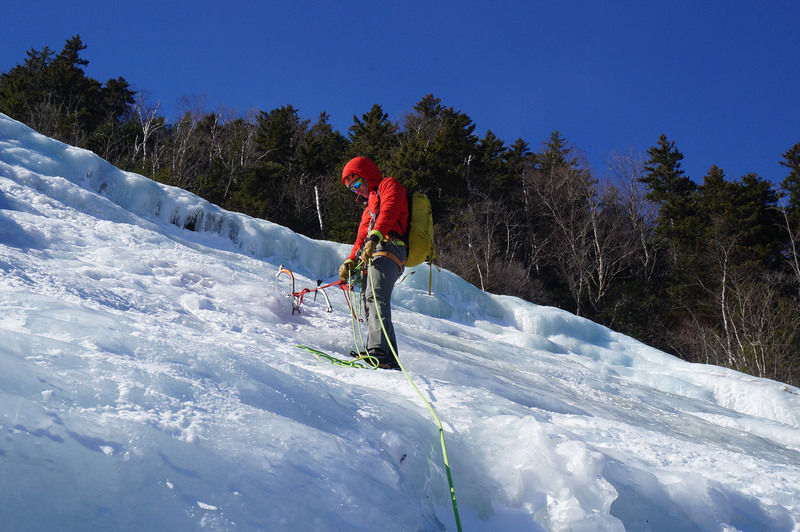 The next three to four rope lengths are Shoestring’s “Ice Pitches.” They begin with a one-to-two pitch climb up several steps of moderate ice, before eventually transitioning to steep snow. The most consistent ice in this section is typically on the gully’s right side. After a brief snow climb, the gully widens and becomes comparatively steeper. From here, there are three ways up. 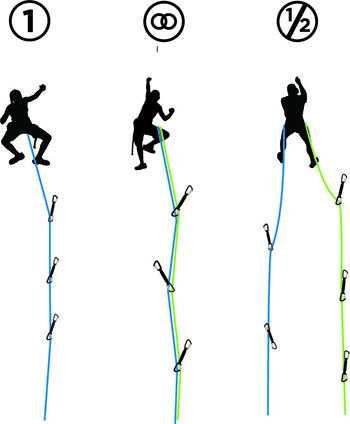 The rightmost variation climbs the line that hugs the wall on climber’s right and is generally considered the easiest route. The center variation heads directly up the middle of the gully, putting climbers on steeper—closer to WI3—and more difficult ice. Heading farther left puts you on even slightly steeper ice. Beware not to take the fun climbing on the far left variation too high, as it eventually climbs out of the main drainage and will require some bushwacking to get back on course. No matter which option you choose, the gully narrows after about two more pitches, with terrain turning into a combination of snow and intermittent ice patches. Trees line the left side, providing some protection and anchor-building opportunities. 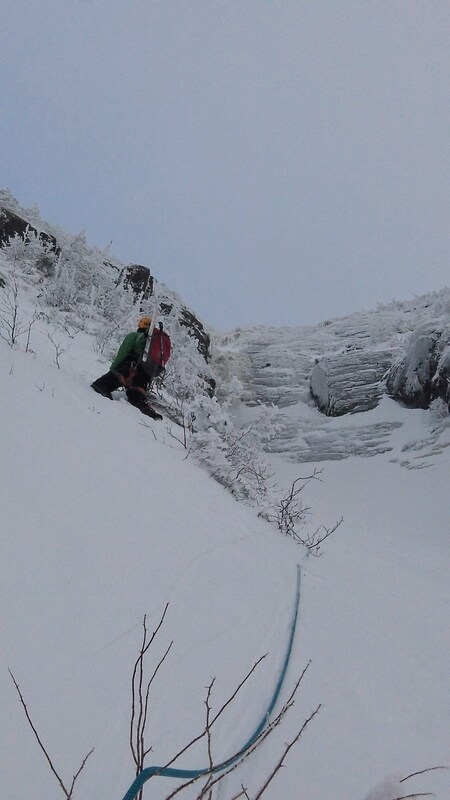 After roughly one-and-a-half rope lengths of snow-ish climbing, exit the gully into the woods. 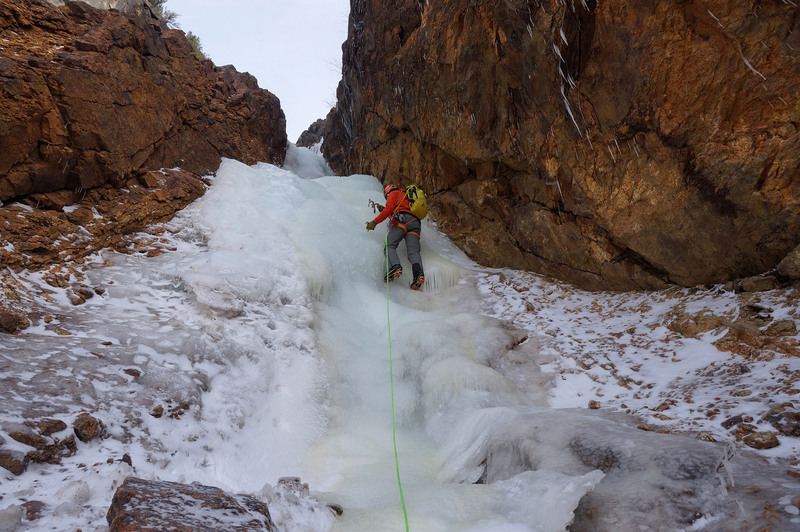 Pro Tip: Parties that move quickly through the Snow Pitches can sometimes catch up to slower climbers just starting the Ice Pitches. 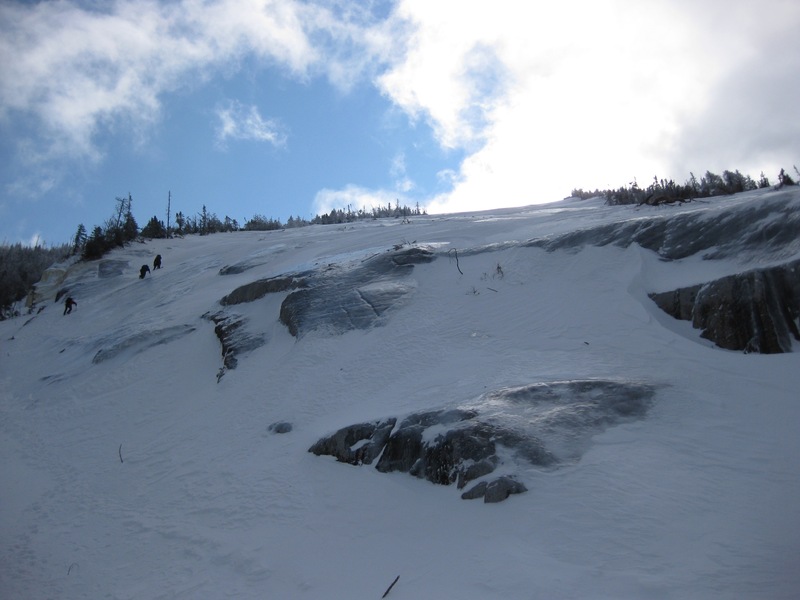 Although the much-wider gully makes the Ice Pitches a tempting place to make a pass, be careful to avoid tangled ropes or getting stuck at an unprotected belay below a climber who’s raining down ice. 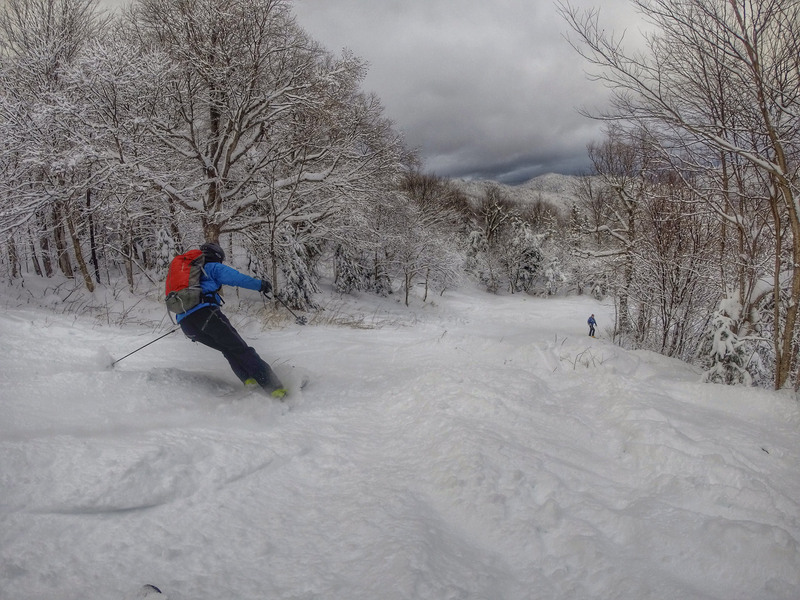 Shoestring Gully offers two alternative finishes for those looking to do more than simply slog up the snow at the top. 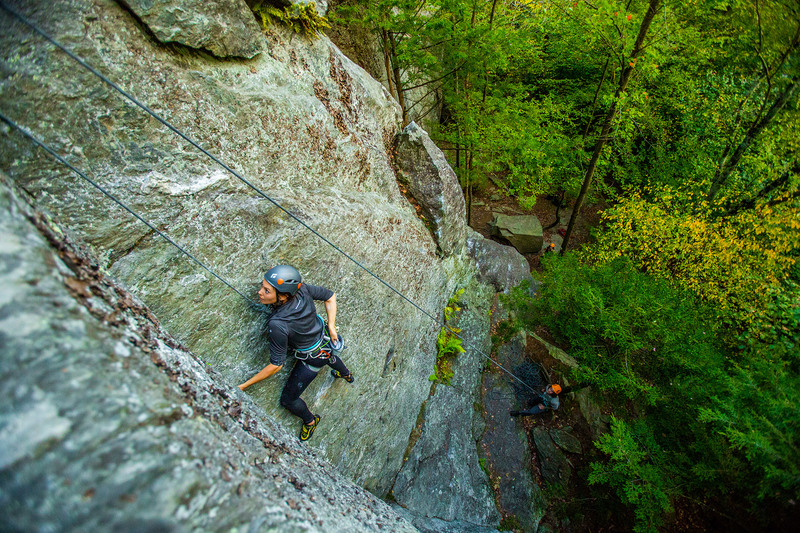 The first option involves climbing the obvious rock wall on the climber’s right roughly one rope length below the woods. 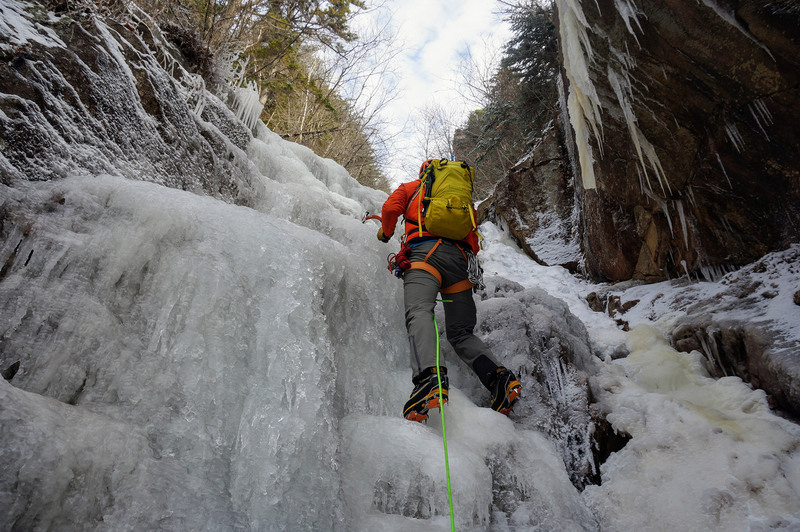 The climbing is moderately rated at 5.5, but finding protection can be tricky, especially if the ice is thin. 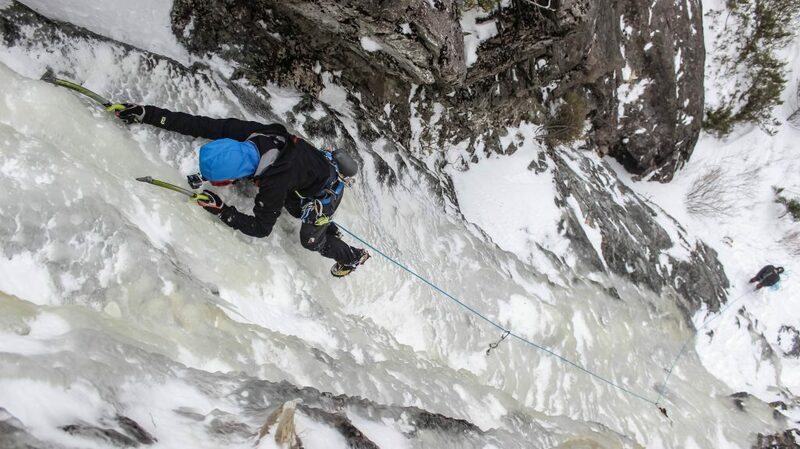 The second alternative is found above the rock finish, and involves climbing a corner with ice rated up to WI3. From the proper finish, climbers should continue walking into the woods until they reach the Webster Cliff Trail (44.179947, -71.382828). The path to the Webster Cliff Trail is often well-broken in, making it easy to locate. The intersection of Shoestring Gully and the Webster Cliff Trail is a great spot to regroup, pack away the climbing gear, and have something to eat. Once everything is packed and you’ve refueled, simply follow the Webster Cliff Trail back to Route 302 and your vehicle. 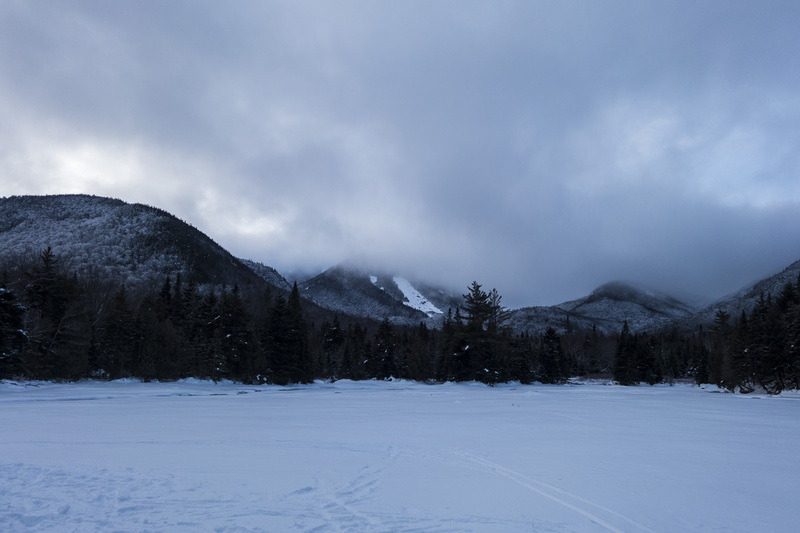 As you head down, make sure to stop at the overlook just a few minutes from the top for a fantastic view of Mount Willard, Mount Willey, and the rest of Crawford Notch. 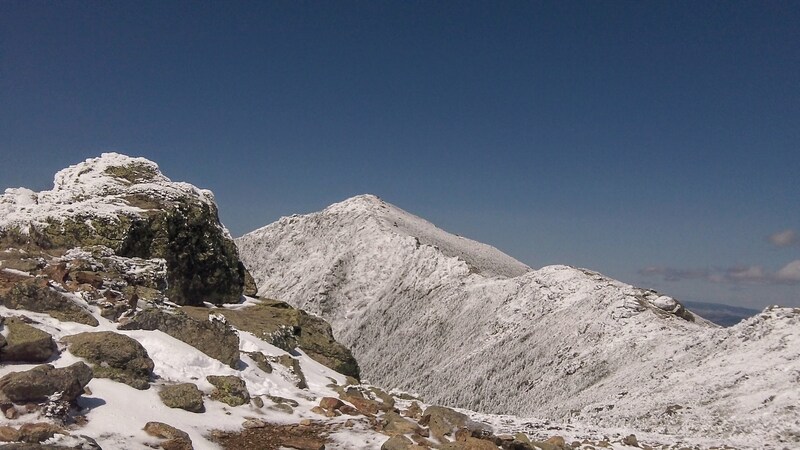 If you didn’t bring MICROspikes, leave your crampons on for the descent. 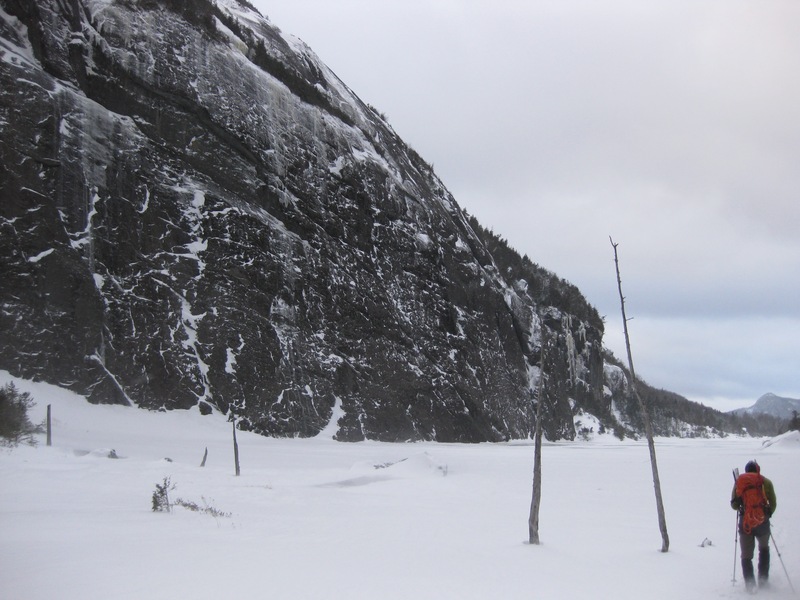 The Webster Cliff Trail descends several steep sections and is often extremely icy. You’ll want the extra traction. 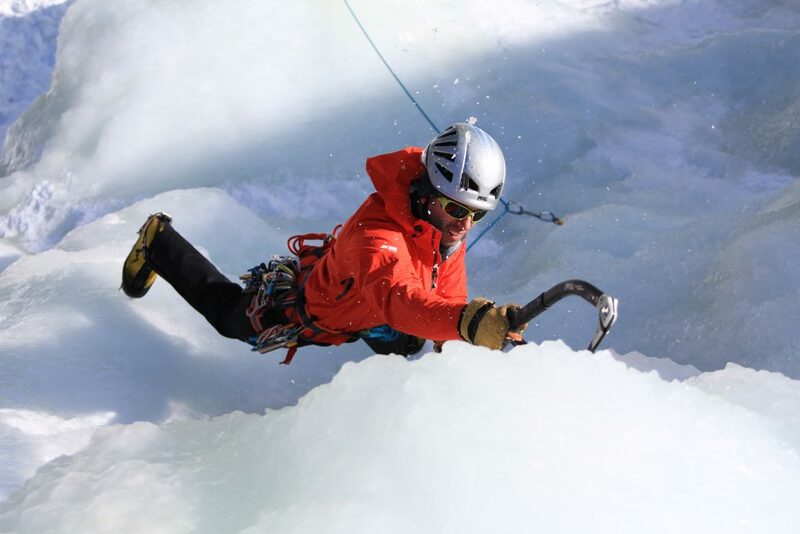 Never climb steep ice without a helmet. Shoestring Gully gets a lot of traffic, and the potential for someone knocking ice down is high. The Black Diamond Vector is a long-time favorite for its great fit and minimal weight. 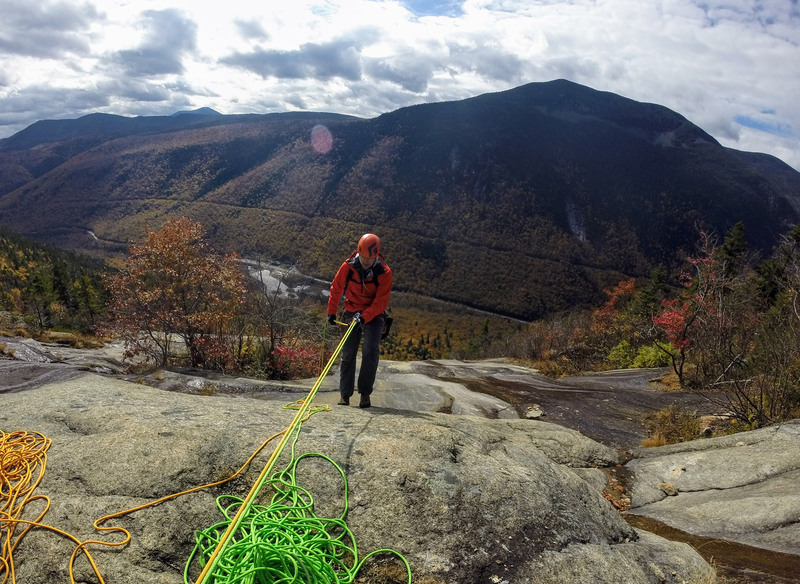 Lugging a heavy rope 2,500 feet up is no fun. Consider lightening the load with the Sterling Rope Fusion Nano 9.0 dry rope. The Black Diamond Dirtbag Gloves are just warm enough for most winter days, durable enough for ice climbing, and offer enough dexterity to handle the rope, making them a key to any Shoestring Gully kit. Whether you’re pitching it out, simul-climbing, or mixing the two techniques, an ascent of Shoestring Gully often involves several stops and starts. 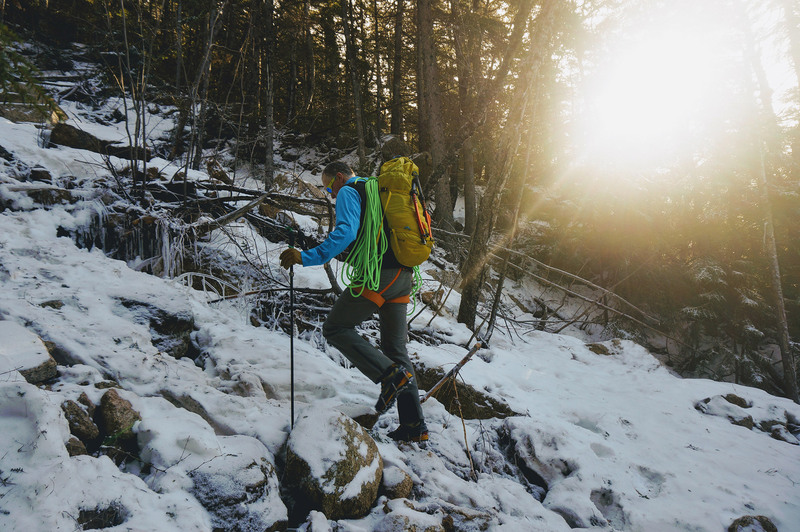 A jacket like the EMS Alpine Ascender is the perfect insulation piece, as it keeps you warm when you’re stopped at the belay, but breathes when you’re on the move. 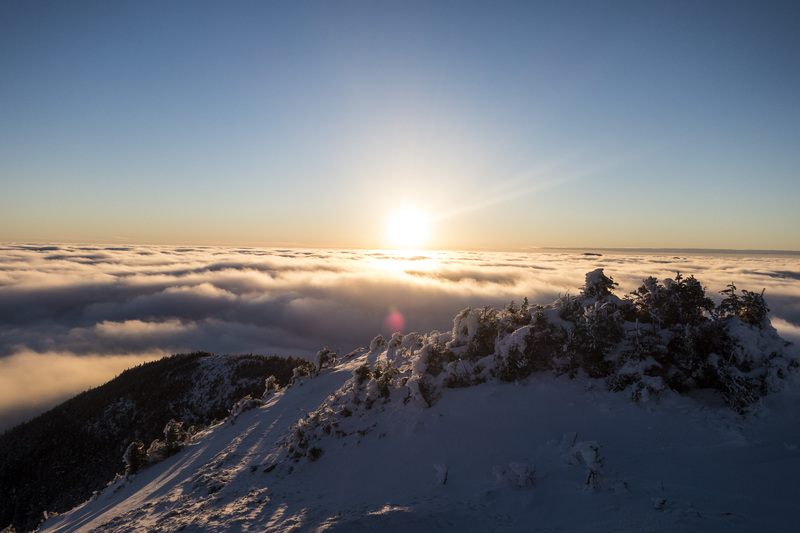 Winter days are short, and everything from conditions to other parties makes it longer than anticipated. Avoid getting stuck in the dark with the super-bright and easily rechargeable Black Diamond Revolt. 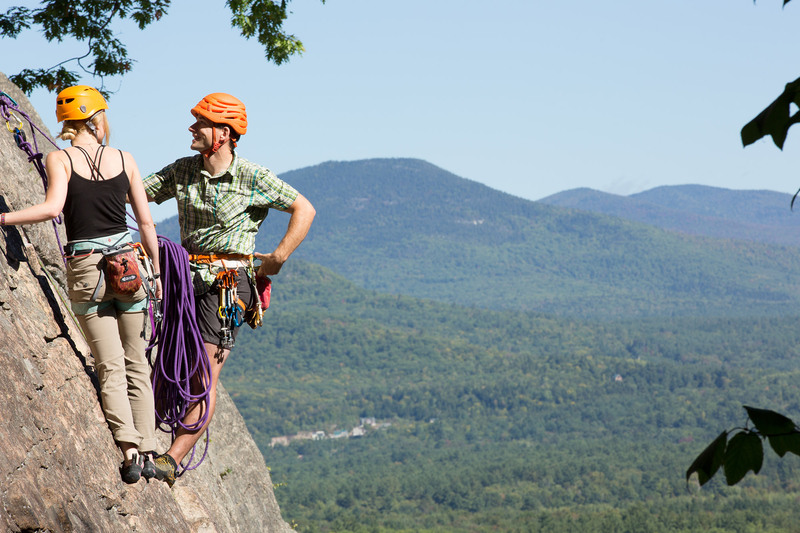 The Petzl Caritool Evo can be added to most harnesses and makes it easy to keep your climbing gear organized. Get there early! This is a popular climb, and arriving early is the surest way to beat the crowds. And, thanks to Shoestring Gully’s moderate grade and fun climbing, expect to encounter people of all abilities—from people taking their first turn on the sharp end to climbers going ropeless. Shoestring Gully gets lots of sun, so it’s a great option even on cold days. Be willing to do variations. There are ample opportunities to pass slower parties by doing different (and sometimes harder) variations of the route’s pitches. 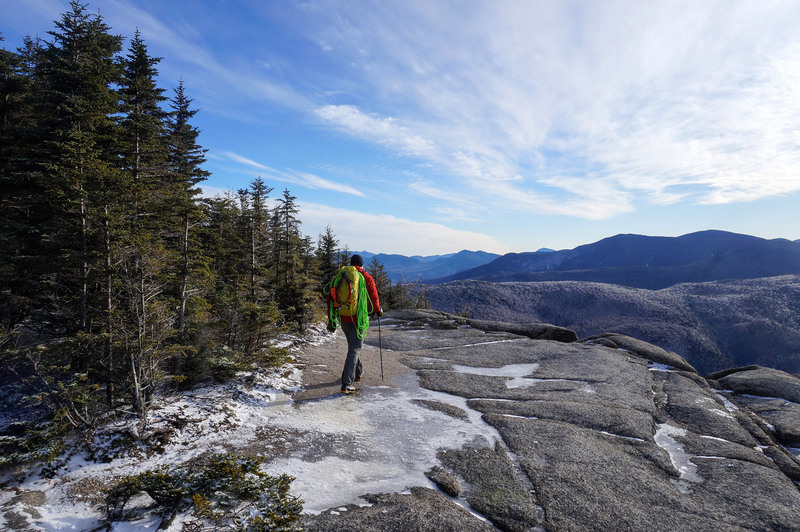 If you finish with time to spare, consider climbing to the summit of Mount Webster, approximately 1.5 miles further up the Webster Cliff Trail. 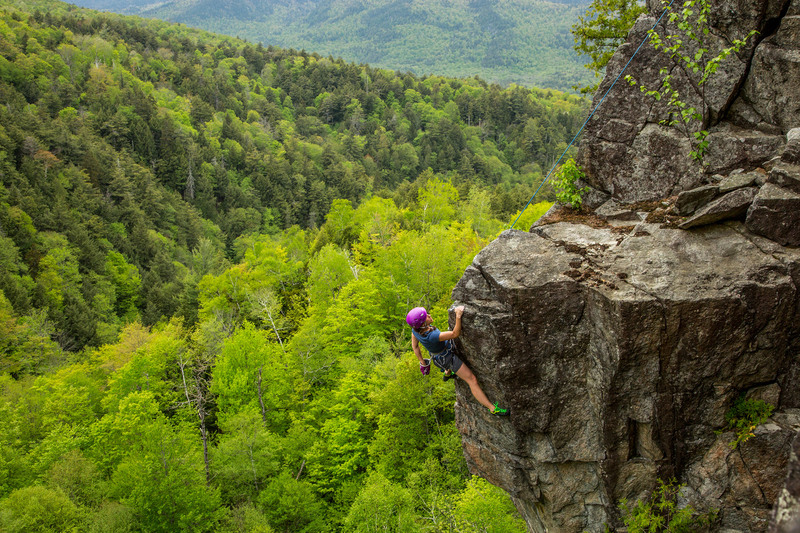 Or, consider climbing another of the area’s moderate multi-pitch routes, including Willey’s Slide, Flume Cascade, and Silver Cascade, to name a few. 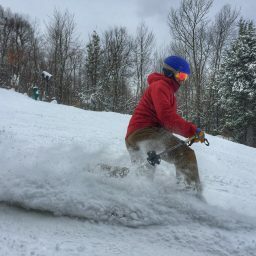 If you worked up an appetite climbing, Fabyan’s Restaurant, located across from Bretton Woods, is nearby, or head into North Conway to visit Moat Mountain Smokehouse and Brewing Co., which is the place for climbers to congregate. Not sure if you’re ready for Shoestring Gully? Contact the EMS Climbing School to arrange for a guided ascent, or spend a day brushing up on your ice skills with one of our guides. 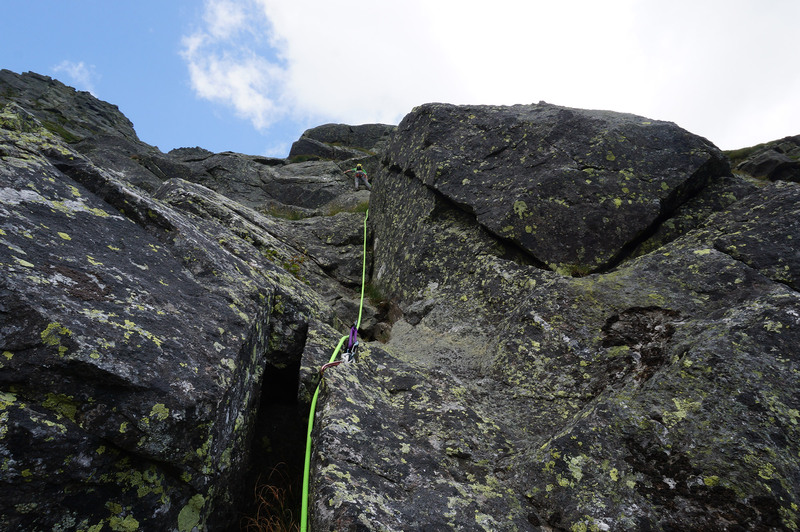 Have you climbed Shoestring recently? Post your experience and the conditions (with the date of your climb) in the comments for others!